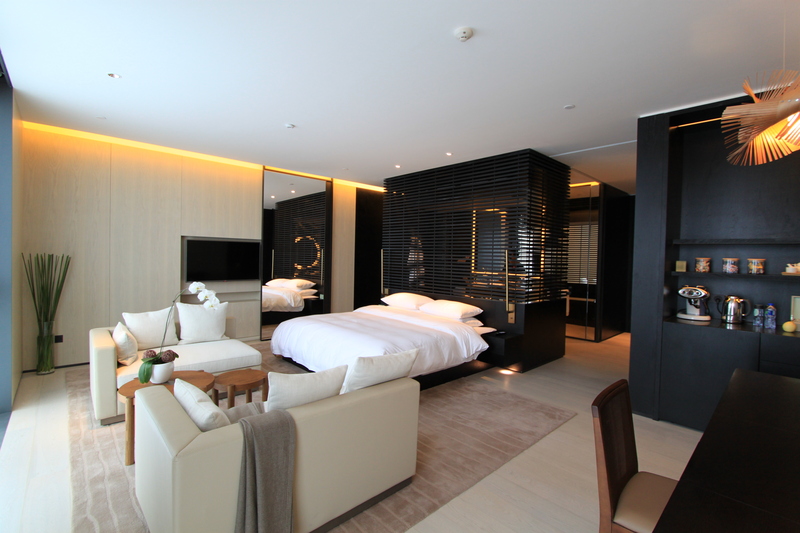 Time for another alphabet countdown on luxury hotels around the world! 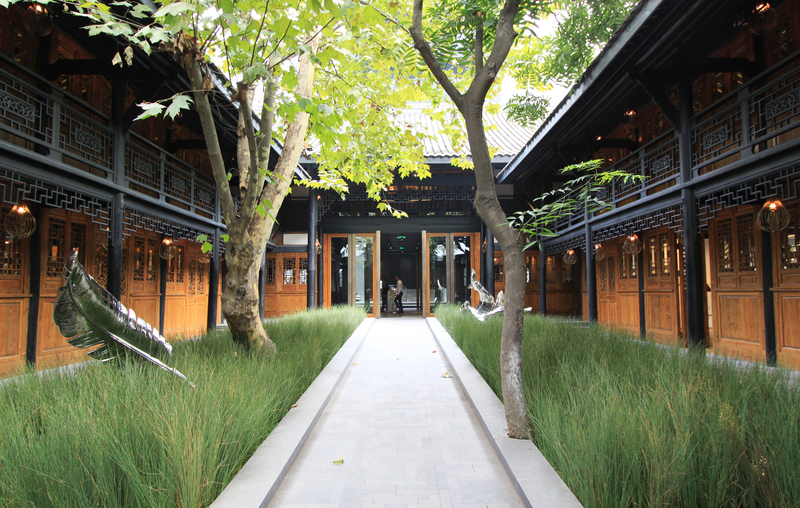 This time let’s skip to letter T, for the newly opened Temple House in Chengdu, China. This post has been brewing for awhile since my stay in August – it’s difficult to write an unbiased review when I have worked on the design and construction of it – Yes 3 years worth of blood, sweat and tears!! Working on the design of a hotel is challenging because even though there’s a limited number of room types (say 10), you always end up with variations on each type due to construction discrepancies and M&E (Mechanical and Electrical) coordination issues. Any architects out there will agree with this – M&E installation, 90% of the time, screws up the original interior design intent unless the client decides to invest in BIM. Anyway, it made the challenge an eye-opening experience for me. 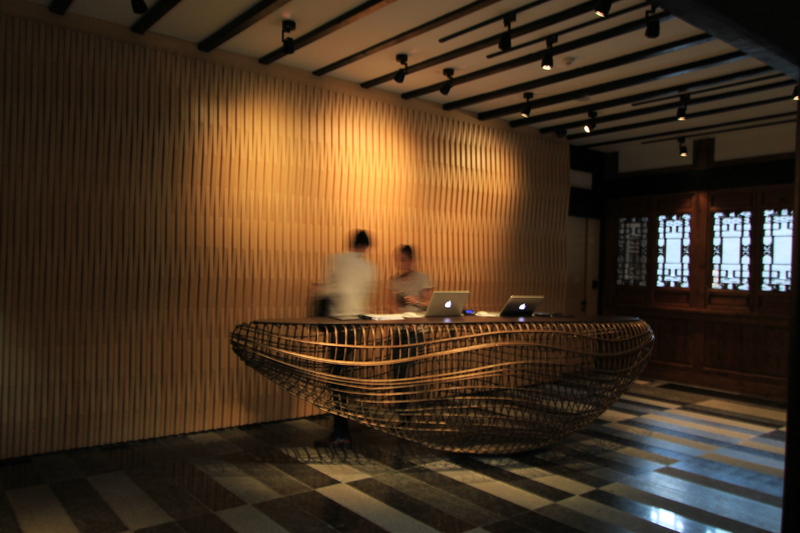 OK, won’t bore you anymore with the archi-talk – time to talk about the hotel! The Temple House is the third addition to The House Collective series by Swire Hotels, after The Opposite House and The Upper House. 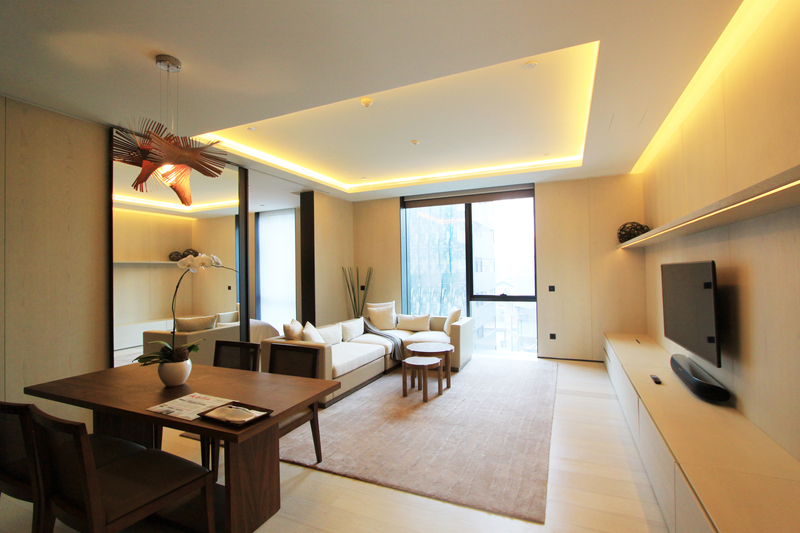 Both the architecture and interior is designed by my old firm, Make Architects. The hotel is made up of a series of new and heritage buildings linked by covered walkways, forming an internal courtyard in the middle. 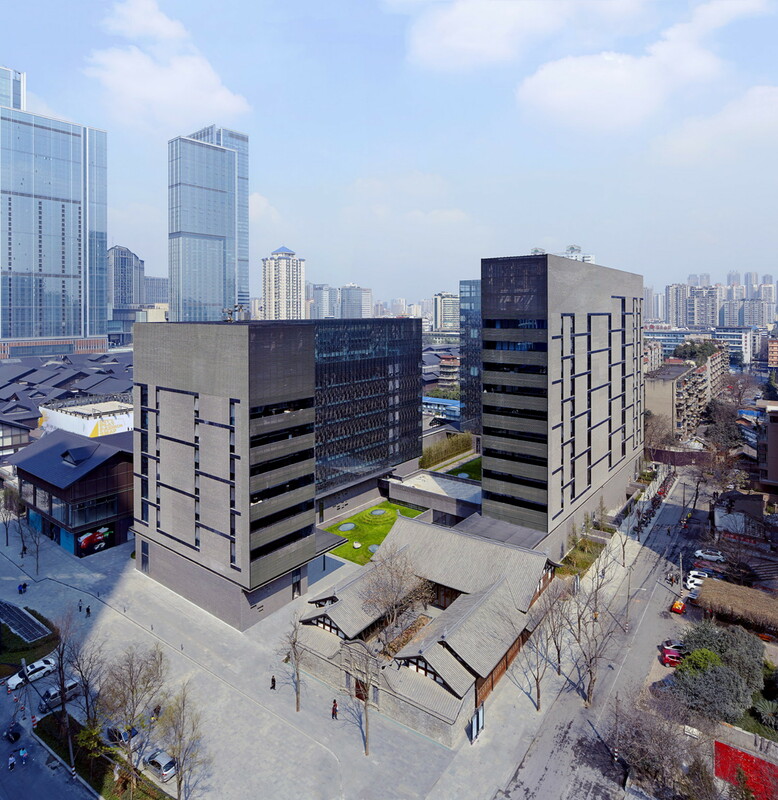 The two multi-storey L-shaped buildings form the outer edges of the courtyard which house 100 hotel guestrooms and 42 service apartment units. The public amenities such as gym, swimming pool, function room, restaurants are carved in the lower ground floor with rough-textured stone walls forming the perimeter walls. Sunken courtyards are introduced to bring natural light into various functions. 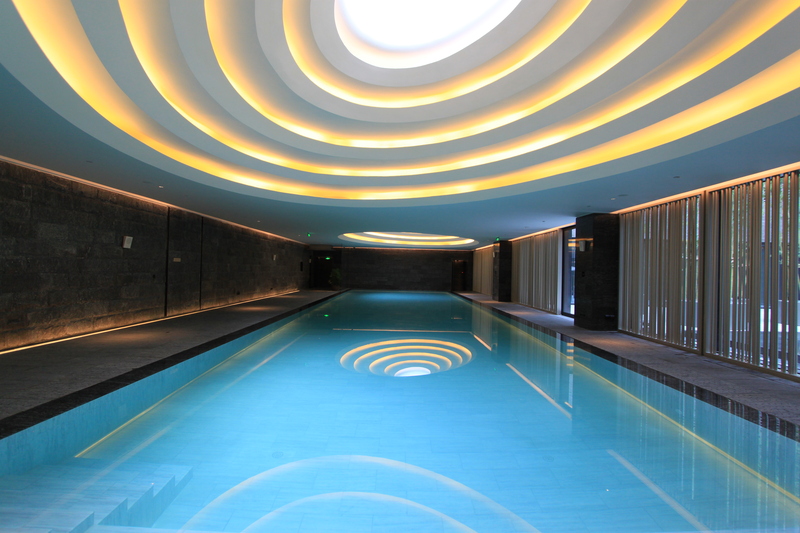 At lower ground floor, it’s hard to miss these dramatic (and very photogenic) circular skylights hovering above the pool, the gym and the function room. 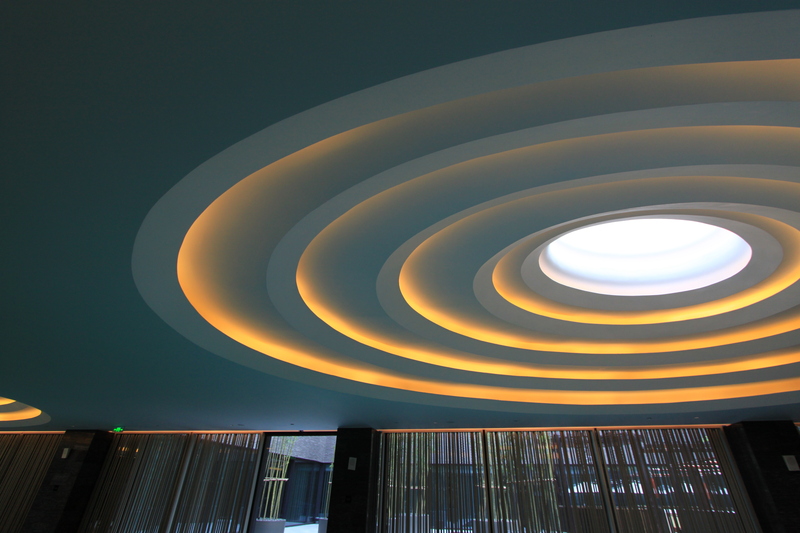 The design of these skylights is inspired by terraced rice paddies in the Sichuan region. The two beautifully restored hundred-year-old heritage buildings on site form the entrance building and the spa. 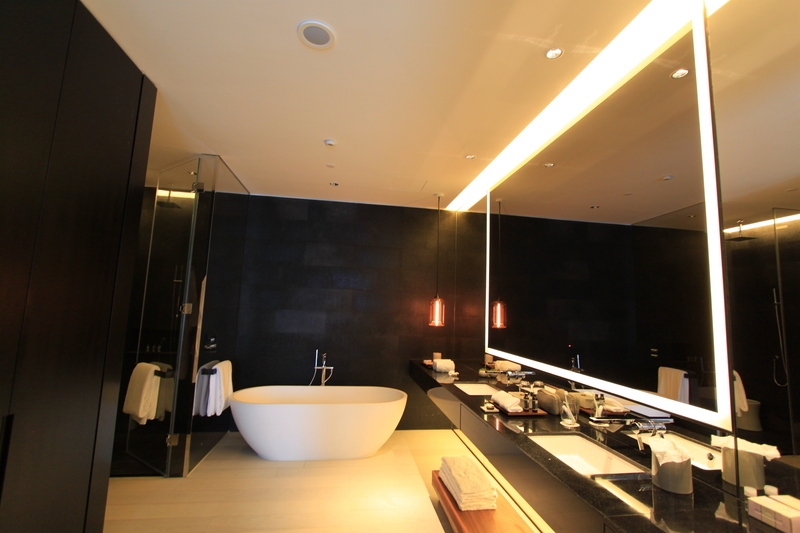 It’s the first spa to be fully operated by Swire Hotels, called Mixun. The entrance building is a small courtyard house with the hotel reception and function area situated in the main building. The library and gallery functions are housed in the east and west buildings. Instead of refurbishing the heritage building using traditional palette of colours and tones, the design took a bold approach in stripping away the colours and only use the traditional black ink and a modestly stained timber as the material and colour palette to differentiate the primary and secondary structure of the building. It’s never been done before but it creates an extremely hip and modern note which is consistent with the rest of the hotel design. The hotel has 100 rooms with 9 room types, the smallest studio starts at 63 square meters which is very generous for 2 persons. We had 3 rooms between the family – Studio 70, Temple Suite and Deluxe Temple Suite. All the rooms are extremely spacious. The neutral palette of materials and colour creates a very welcoming and calming feeling for the guests to enjoy. Try to book the Temple House Suite (room 05s) if they’re available. In my opinion, this is the best room in the house with the open view towards Taikooli and other new developments in the city. If you have a large family, this room could also form a large suite with the Studio 60 room next door (room 04s). During our visit, the spa wasn’t ready yet so we didn’t get to try it out. 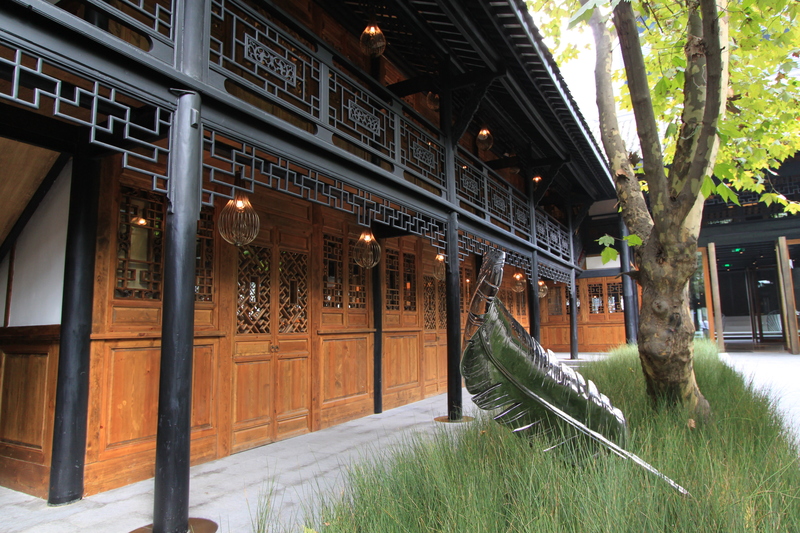 However, we managed to get a sneak preview and had a bite at the tea house which serves regional chinese cuisine. There are two VIP suites and about 5-6 private one person ensuite rooms. 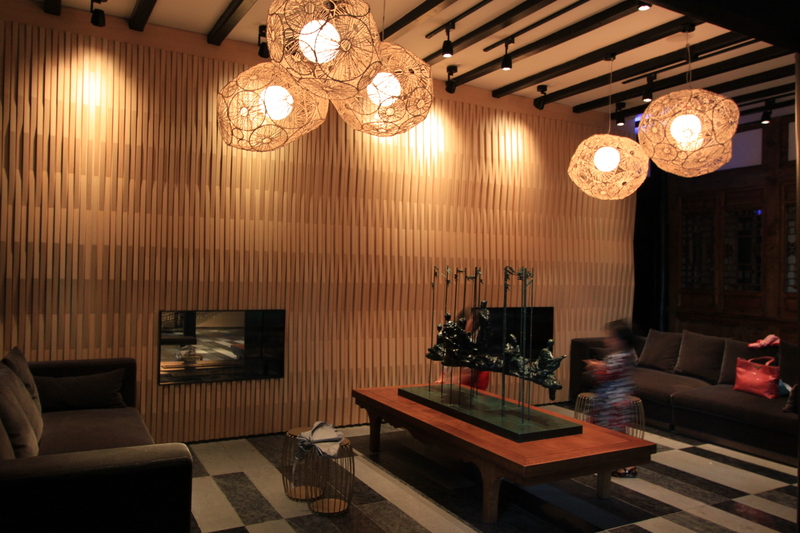 During concept design stage, we wanted to create a cozy cocoon-like experience for the guests. We wanted to expose as much of the original structure as possible and keep the ceiling undisturbed from ventilation/light fittings. 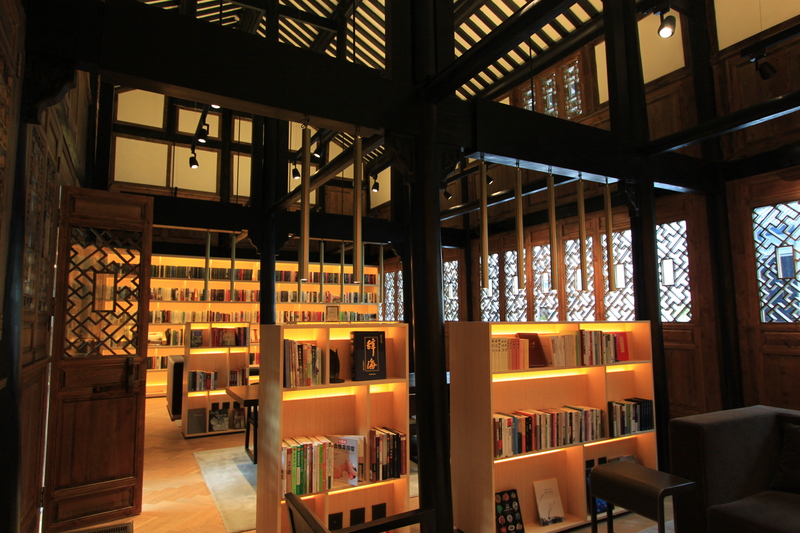 Therefore all the walls of the rooms were elevated from the structure, which doubled up as storage space. 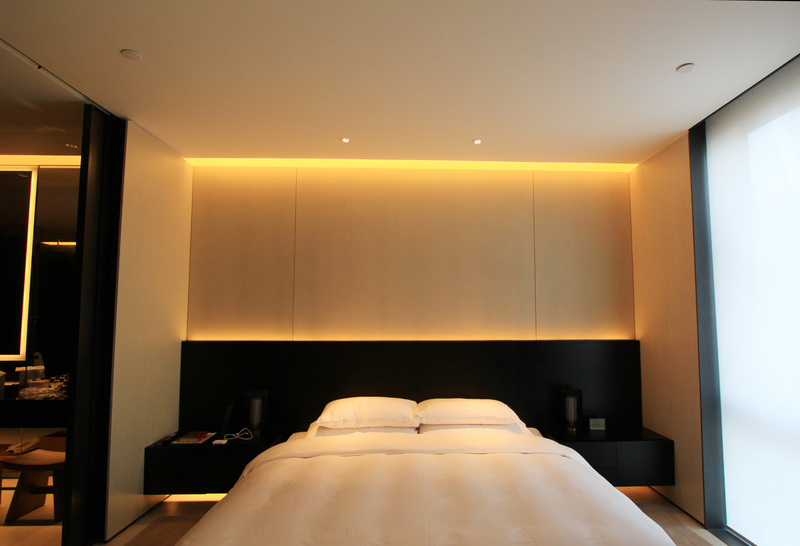 The lighting were all done through the top of the walls creating an ambient mood. The best part about staying at a Swire Hotels development is taking home their vanity kit and the freebies which they encourage you to take. Skincare-wise, they introduced us to a lovely skincare brand, Appelles from Australia. It reminds me of Aesop -Everything smells and feels heavenly! If you’re not familiar with the hotels by Swire, their mini-bar is called the “maxi-bar”, where all the beverages in the fridge (except when labelled) and snacks displayed on the shelves are complimentary (and they get replenished over the course of your stay!) Well, the room price per night is quite expensive, so the reality is that we have paid for the these “complimentary” items anyway. Nonetheless, it is a clever way to make their guests feel special – and it works! 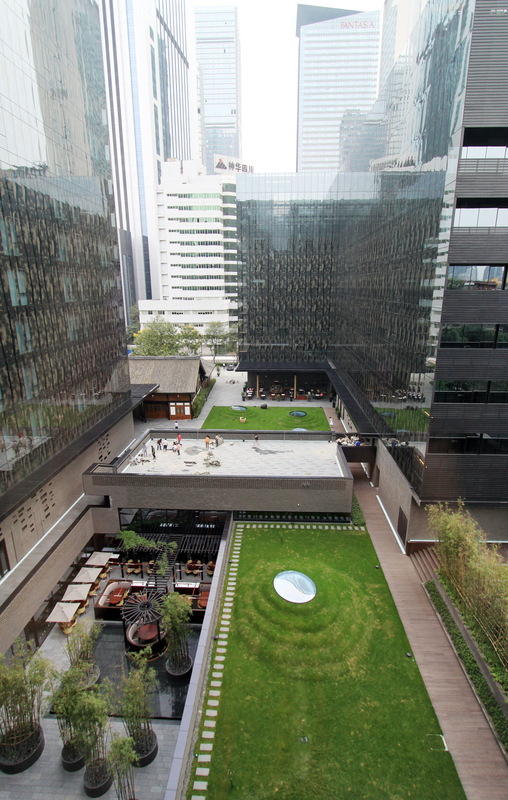 There are three restaurant outlets at Temple House which includes Temple Cafe, Tivano and Jing Bar. The interior for all three venues are designed by Avroko. Breakfast is served at the Temple Cafe which is their all-day-dining outlet. Western-style breakfast is good for Chengdu standards and the price is very affordable, which helps to attract young local crowds. Tivano, in the lower ground floor, serves Regionally-inspired Italian cuisine. Their pizzas are made with their on-premise wood oven, really delicious – worth a try! The drinks at Jing Bar are also worth a mention – their menu is thoughtfully designed celebrating the speakeasy, prohibition style. One of the region-inspired drinks is called Sichuan Mule – A Moscow Mule with sichuan peppercorn infused vodka. This drink is extremely memorable because I love Sichuan Peppercorn! It was very refreshing with the right amount of spice kick! We stayed there during the soft-opening weeks, so a lot of things were still in trial period. Nonetheless, our stay was very enjoyable thanks to the guest relationships team – a special mention to Kylie and Edward from Hong Kong. They were so attentive – we see Kylie around the hotel during the day and even after her shift, she would be hanging out at Jing Bar having a drink and greeting the house guests! Our housekeeper was also super sweet, she found out my husband wasn’t feeling well that day and she immediately brought over more bottles of water and also asked us the day after to see how he felt. Very thoughtful welcome biscuit basket and note from the GM! The Temple House has just won the “Daring Design” Category on Tatler Travel Awards 2016. Yay! I’m very proud to be part of the design team that worked on this project. 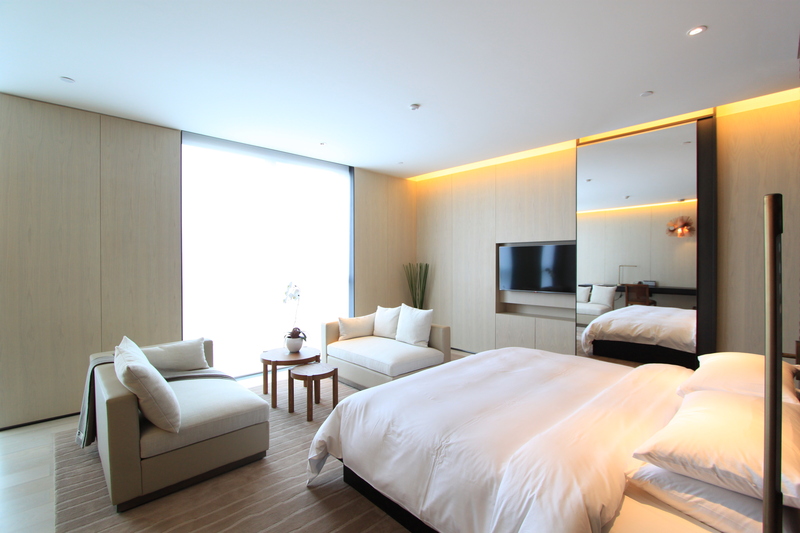 It will definitely be reigning the best hotel in Chengdu or even China for awhile – I’m not biased, I swear, it is just simply the best one! Room Tips: Depending of availability, try and ask for the 05 rooms, they have the best views towards Taikooli. All photos are taken by me unless stated in the captions.